Extend your evenings with the warmth of a fire table in your outdoor living space. 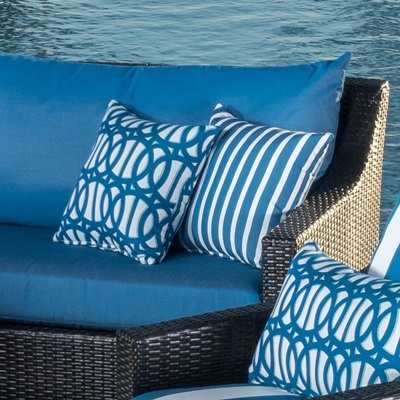 Sink into comfortable, deep seating while you host a conversation with all the delight of a fire without the mess to clean up when you're ready to retire. 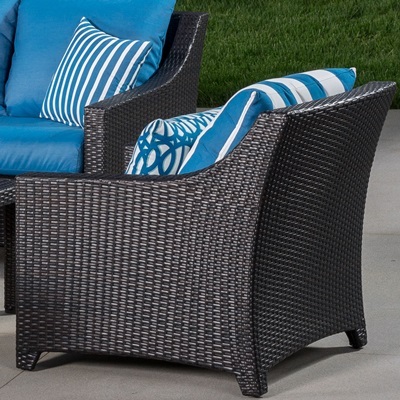 Featuring our durable seating sets, you can stay warm and comfortable with a collection that will weather the storms while providing you with a beautiful focal point to gather around with friends and family. 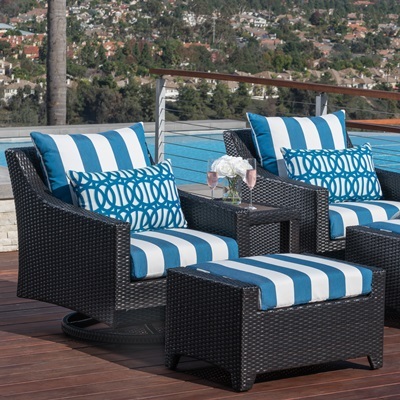 Set includes two motion club chairs, a loveseat, four coordinated accent pillows, an ottoman, and a propane-powered fire table. Chairs rotate a full 360-degrees, and gently rock back and forth. CSA Certified fire table is capable of putting out 55,000 BTU. Frames are constructed with high quality, powder coated aluminum for years of durability. Seats come fully assembled, with minor fire table assembly required.